BUKIT LANJAN: Growing number of migrants start intimidating Malaysians! Take a closer look of the two visuals above. Does the crowd look like foreigners to you? Look closer! It was snapped in Kuala Lumpur! Scary, don’t you think so? “Yes! You better believe it. The last count in 2010, we have 2.07 million legal foreign workers, making up 6.9% of Malaysia’s 30 million population,” Gerakan Deputy Speaker Syed Abdul Razak Alsagoff said. “That’s only the legal migrant workers. What about the number of illegal foreign workers?” he asked. Syed Razak said: “The federal government needs to urgently take immediate measures to rein in on migrant workers, especially the illegals. “They bring along their culture and cause social problems. They also contribute to crime and murders. "And, just visit and take a look at Kuala Lumpur's Chowkit and Petaling Street and see for yourselves what the two enclaves have become. In Chowkit, the Malay traders have been replaced by Indons. 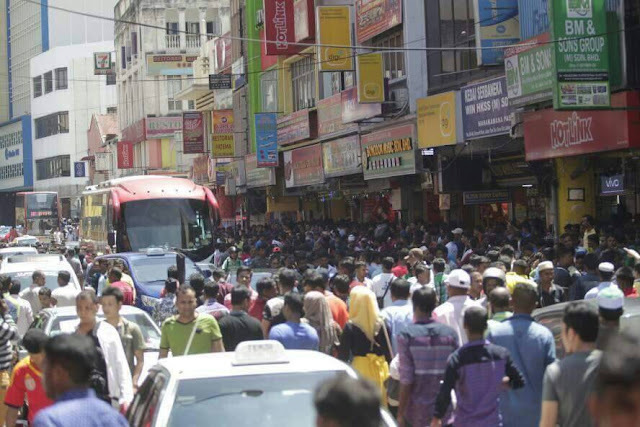 "In Petaling Street, the Chinese are being replaced by foreigners, Bangladeshis and others!" Syed Razak, who is Gerakan’s nominee to contest N.37 Bukit Lanjan in the coming 14th General Election (GE14), said the fast growing number of migrant communities “is becoming a public security threat to locals nationwide”. “How is it that the illegals are able to remain in the country and work without permits? Are our police and immigration enforcement agencies that inefficient to look after the security of the country?” he asked. Syed Razak said the two pictures above showed “migrants are able to gather or move around freely in Malaysia”. “Why are our authorities turning a blind eye to such scenes where Malaysians feel intimidated,” he asked. Syed Razak said the federal government must take immediate effective measures to “seize control” of the situation or risk the country become dominated by migrants. 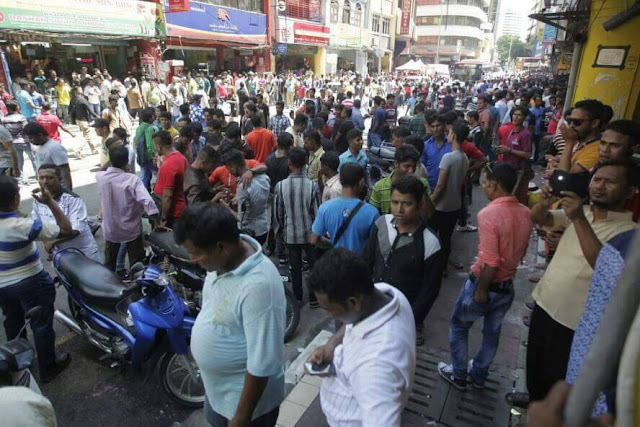 No one can tell for sure how many migrant workers we actually have in Malaysia. Even the authorities and individual officials offer their own variable numbers, not so much because they have something to hide from the public but simply because no one knows exactly how many of them are here. According to the Human Resources Ministry, there are some 2.1 million registered migrant workers - what we call legal foreign workers - in Malaysia. However, the number of overstaying illegal foreigners is even larger, probably around three million. The Malaysian Employers Federation (MEF) estimate is even more alarming, putting the total number of legal and illegal foreign workers at six million. Mr Low Kian Chuan, secretary- general of the Associated Chinese Chambers of Commerce and Industry of Malaysia, seems to echo MEF's hypothesis, arguing that the ratio of legal to illegal foreign workers in the country now stands at 1:2, meaning there are two illegal migrant workers for every legally registered worker here. Given that we now have 2.1 million registered foreign workers, the number of undocumented ones could easily hit four million in a developing country of 31.7 million. How serious could the social problems get? Problems that come with these people include terror threats related to the Islamic State in Iraq and Syria terror group , human trafficking and moral deprivation, among others. Unfortunately it is next to impossible for Malaysians to go without these people. Many of our economic sectors are excessively dependent on foreign workers. When the government froze the import of new foreign workers, some local furniture factories had to wind up, owing to the labour crunch. The raids carried out by the immigration department against unregistered foreign workers have left many construction sites short-handed and plantations virtually unattended to. 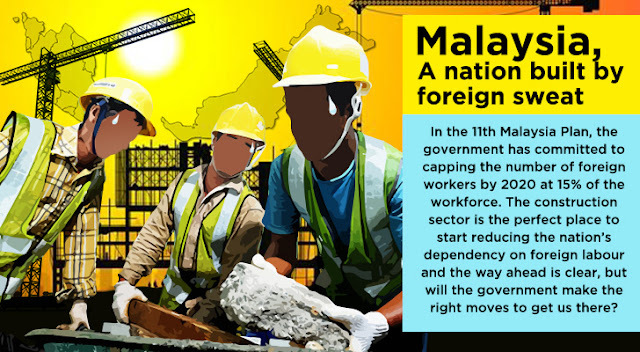 It has been stipulated under the 11th Malaysia Plan that the ratio of foreigners in the country's labour market must not exceed 15 per cent, or 2.1 million. But thanks to the presence of a multitude of illegal foreign workers, the ratio would have reached a jaw-dropping 43 per cent, far beyond what the labour market actually requires. These foreign workers have hailed from neighbouring countries like Indonesia, Bangladesh, Vietnam and Nepal, hired mainly in the construction, manufacturing, agricultural and services sectors or as domestic help. The influx of large numbers of foreigners into the country has seriously impacted the local demographic structure. Together, the registered and unregistered foreign workers have formed the third-largest community in this country at around 19 per cent of the total population. With only 2.22 million people, the Indian community has long been displaced from the top three to become the fourth-largest community here. On Feb 18 this year, Human Resources Minister Richard Riot Jaem travelled all the way to Dhaka to sign a memorandum of understanding with the Bangladeshi government for an additional 1.5 million workers over the next three years. This decision has since met with powerful objection from the Malaysian public. MEF executive director Shamsuddin Bardan was of the opinion that the government should refrain from bringing in more foreign workers, given the current sluggish economy. 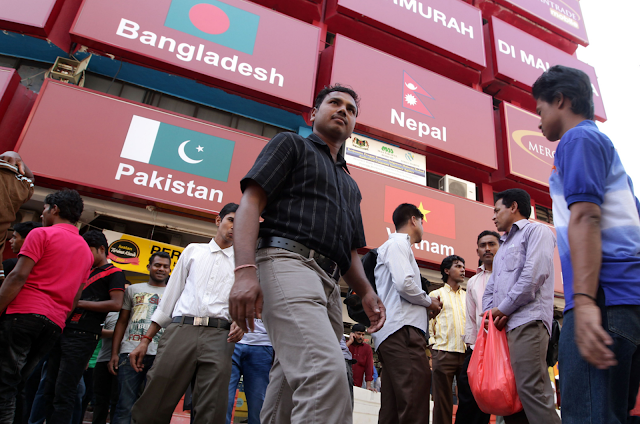 Moreover, the influx of 1.5 million Bangladeshis will send the strength of the foreign workforce to a staggering 7.5 million, far outstripping the needs of the local market. If this were to materialise, their sheer numbers should overtake that of Chinese Malaysians, currently the second-largest ethnic group in the country. More recently, the government has also announced that the private sector can hire security personnel from two other yet-to-be-decided countries, in addition to Nepal. I recently passed by the vastly popular Kuala Lumpur Convention Centre park in downtown Kuala Lumpur, and all that came into my sight were lots and lots of foreign workers. I thought I was in Dhaka, which I once visited. In the past, the city used to be completely hushed during the festive seasons when most of its residents were back in their respective home towns. No more! Our streets are now filled to the brim with migrant workers. Why have so many foreigners flocked to Malaysia for a living and why do they later decide not to leave this country? Malaysia is endowed with a wealth of natural resources and has no major natural disasters. Well, there was a minor tremor in East Malaysia not long ago, but volcanoes and typhoons are total strangers to us. Malaysia is a land of plenty. Getting the stomach filled is never an issue, so long as one is willing to work. Another pull factor is that Islam is the country's official religion and Muslims constitute the dominant community here, making the country a veritable paradise for people like Indonesians, Bangladeshis, Pakistanis and Burmese Rohingyas. As if that is not enough, Malaysian employers' dependence on foreign workers has reached a stage that a total weaning from foreign labour is squarely impossible. The reason is beyond question: Foreign workers are inexpensive, hard-working and will not resist 3D (dirty, dangerous and difficult) jobs which locals instantly shun. To the employers, Malaysians will only take jobs in a comfortable working environment, with no exposure to harsh elements, stench, dust or overtime. As a result, the local construction, agricultural, services and manufacturing industries have been invariably anchored by foreigners. As time goes by, even the hawkers are now hiring foreigners who, after some time, will take over the kitchen as well. Some Indonesians even bring their families here after settling down while others find their better halves here and decide to make Malaysia their new home. Many good-looking Bangladeshi men, in the meantime, marry local women and are subsequently granted resident status. It is therefore easy to understand why the number of legal and illegal foreign workers just keeps going up. We cannot deny the positive contributions of these workers to the country's economy, but the unpredictable government policies have made it very difficult for employers to map out their long-term hiring policies. This, coupled with lax enforcement and the absence of an effective mechanism to manage migrant workers, has resulted in millions of foreigners outstaying their employment contracts. To better control the number of foreign workers in the country, the immigration department will from next month take stern action against employers hiring unregistered foreign workers under the Immigration Act 1959. Under the measure, employers found hiring or sheltering overstayers or holders of counterfeit visas and passports will have their bank accounts and assets seized or frozen. •This is the 12th article in a series of columns on global affairs written by top editors from members of the Asia News Network and published in newspapers across the region."